Other Gear & Accessories Discuss Rhino Gear, and Accessories. You all are familiar with the dry lube used on Hunterworks machined sheave and HV roller weights. Well that formulation has been tweaked a little and offered as a standalone product. You may have seen me previously pimp out dry lube on anything that requires lubrication from my guns to anything where I want the benefits of a dry lube that gets affected by dirt and/or water. I've used it on my sheave shafts and seals, hinge points, chainsaw blade, drill bits, my AR-15, as well as my daily-carry Shield 9 mm. The problem with current dry lube spray offerings is that they're sold as a spray or liquid and applying it to the surface I want, in the concentration I want is difficult. Many times it goes where I don't want it, I've recently tried to use it on my soft cab zippers and it didn't do a very good job as it only got applied to the outside of the zipper teeth and not between them and there was a lot of waste. 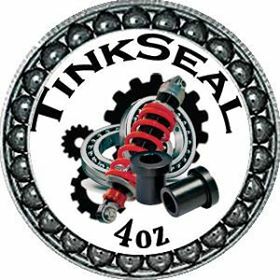 TinkSeal looks like a grease, and you may think that's what it is when you see it but it's not. The purpose of grease is to lubricate 2 surfaces and it needs to say liquid soluble to be effective. TinkSeal's only commonality with grease is that it uses the same property of being able to cling to surfaces to stay where it's intended to treat. Grease is a lubricant. TinkSeal is a surface treatment. Its nano particles will burnish into the surface it's applied to, from metal, to plastic, to rubber. It will not attack rubber seals like some liquid or grease lubricants. When grease dries up, it loses it's lubrication benefits. When TinkSeal dries, it leaves behind the dry lube treatment on the surfaces it was burnished into. Dry lube sprays use a liquid aerosol to disperse the lube and then that carrier quickly evaporates. You have little control where the lube goes, even with the straw attachment and it can drip onto unintended areas. By using a heavier carrier that you apply mechanically, you have precision control of where the treatment goes and it stays there for a prolonged time until the carrier eventually dries out. Think of it like crazy glue gel. Regular crazy glue goes everywhere you don't want it going while crazy glue gel stays put until it dries. The other thing with TinkSeal is that it's many times more concentrated than dry lube sprays. A little goes a long way. It doesn't attract dirt and repels water. The carrier itself is a good lubricant, better than Mobil 1 red grease, so your parts will have good conventional lubrication until the dry lube is fully applied to the surfaces. It's available from Hunterworks now. Call to order but it will be available for purchase directly from the website soon. I will be using it in a number of applications off the bat and will report back my results.